Wednesday we had our board meeting of the Pontifical Mission Societies in the archdiocese. We heard some very encouraging reports about all their activities. 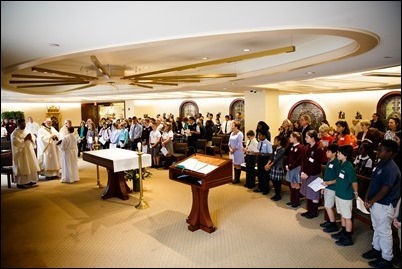 Earlier that day We had just hosted our annual Mission Education Day for Catholic school students, which is presented by one of the Pontifical Mission Societies — The Missionary Childhood Association. 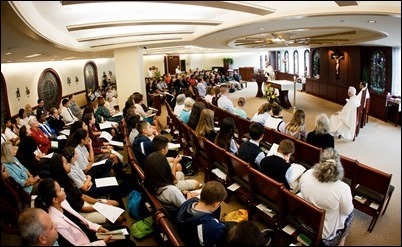 I was very happy to celebrate morning Mass for them in our Bethany Chapel. 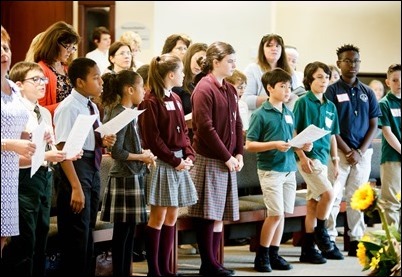 We were joined at the Mass by Father Dermot Roache from the SMA Fathers and Father Jim DiPerri who was there with his student choir, which did a fabulous job singing for us at the Mass. In my homily, I spoke to the children about the Great Commissioning in which Jesus sent his disciples to the ends of the earth to announce the Gospel. 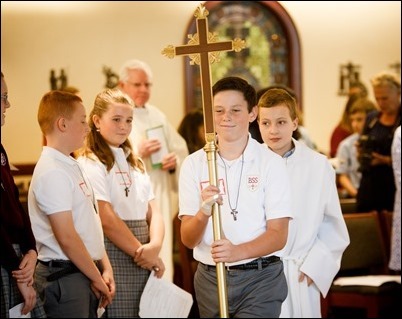 I told the students that we are here today because the disciples obeyed that command, and now it is our turn to pass on the treasury of the faith to future generations and to work so that the light and joy of the Gospel can reach every heart. 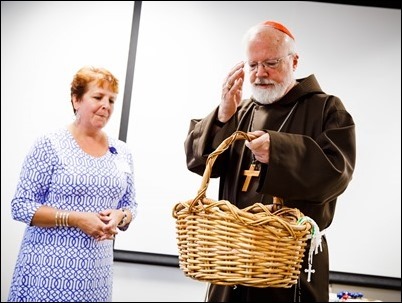 I also spoke about the mission experience of my own Capuchin community, particularly in Papua New Guinea. I told them what a change and impact it had on the people when the Gospel was proclaimed to them. 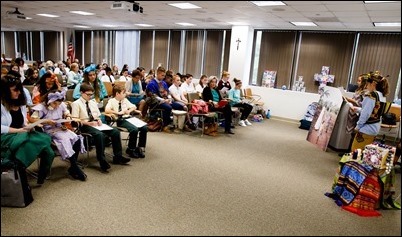 Following the Mass, I visited the students in their meeting room, where I blessed the Mission Rosaries that were presented to each of them. In the history of our diocese, we have letters from Bishop Fenwick writing to the Propagation of the Faith in France thanking them for the help that they had given to the Church in Boston. Now, it’s our turn to help emerging local Churches in other parts of the world. 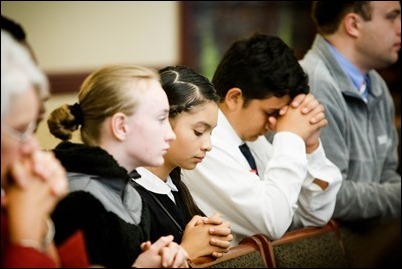 The Missionary Childhood Association gives our young Catholics the chance to feel a part of the Church’s missionary activities. We are very proud of our Pontifical Mission Societies Office, under the direction of Msgr. Bill Fay and Maureen Heil. 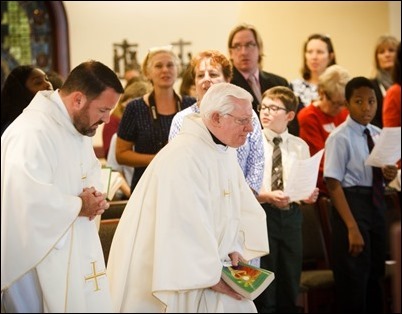 Boston has long been one of the leading dioceses throughout the world in supporting the missions, which is a tradition that goes back to the time of Cardinal Cushing, who himself had been the director of the Office of the Propagation of the Faith. 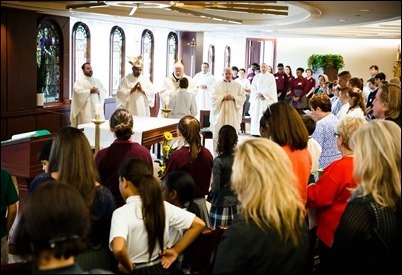 Supporting the missions is a very important part of who we are as an archdiocese. 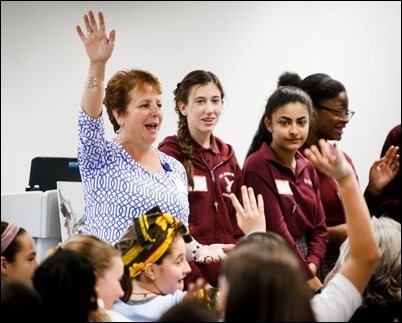 Because of this, I have asked Maureen Heil to share some her reflections with you about our gathering with the young people on Wednesday as well as the history and work of the Pontifical Mission Societies in the Archdiocese of Boston. The lesson is this: if you are baptized, you are a missionary. Many of us think of missionaries as people who go to faraway places to spread the Gospel in word and deed. While that is true, our baptism calls us all to have a hand in this vital work of serving God’s poor and bringing them the Good News which we all love and by which we live. Some give to the missions by going. Others go to the missions by giving. 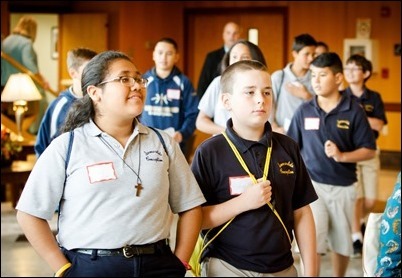 Catholics of the Archdiocese of Boston have an incredibly strong history of support for the missions through what is now known as the Pontifical Mission Societies. While the United States was considered a “mission dependent” territory by the Vatican until 1908, here in Boston we opened our first office of the Propagation of the Faith 10 years before that. Pope Pius XI combined four mission societies under the title ‘Pontifical’ and raised them to a Vatican status. They are the Propagation of the Faith, the Missionary Childhood Association, the Society of St. Peter Apostle, and the Missionary Union. In 1958, Cardinal Cushing asked the Director of our office, Msgr. 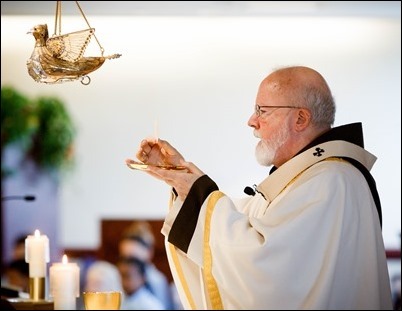 Ed Sweeney, to assist him in forming the foundation of what is now the independent Missionary Society of St. James the Apostle, serving the poor of Peru. 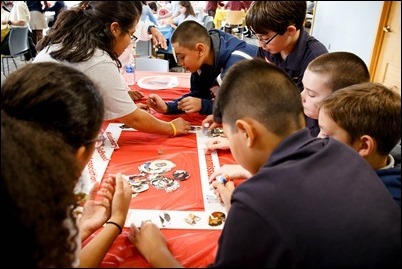 With the help of countless everyday Catholics, Boston’s office continued to make its mark on the world. We sometimes raised more donations in solidarity for the poor of the missions than some entire First World countries under the leadership of many, most notably Msgrs. William Glynn and Andrew Connell. Fast forward to the present time and the charism of our Societies remain the same — to educate and animate the faithful of the archdiocese about the needs of our brothers and sisters in the missions so as to stir up a prayerful spirit of support for the ever-growing universal Church. 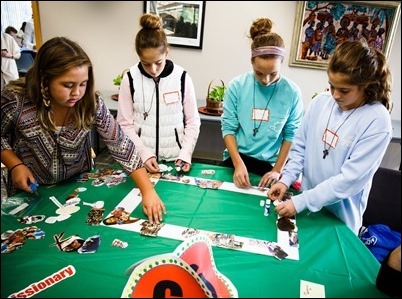 We start this beautiful faith formation process with children through our Missionary Childhood Association. 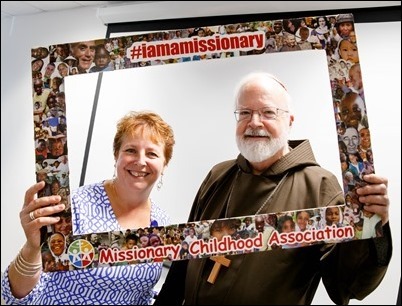 The Missionary Childhood Association (MCA) was founded as the Holy Childhood Association in 1843 by French Bishop Charles Forbin de Janson after his eye-opening mission trip to the United States. He returned home after two years here, one of the largest mission territories of his time, and began an appeal to the children of France: pray one Hail Mary every day and sacrifice to help the children of the missions. 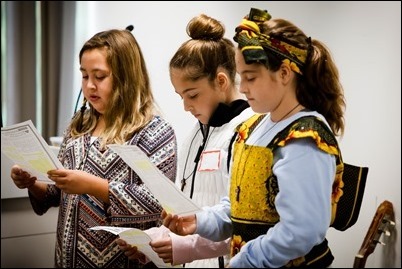 He asked them to earn their own funds by doing odd jobs, giving up treats, or going without presents so that children in the United States, China, and other mission lands could receive the gift of faith through missionaries. He built this Catholic mission agency with children as the protagonists. 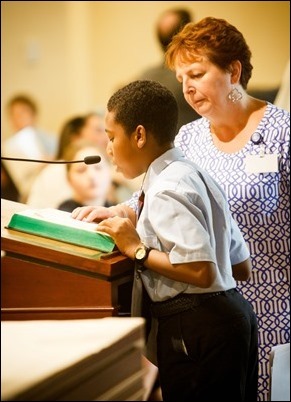 Today, MCA continues to follow the plan laid out by Bishop Forbin de Janson — our motto is still “children helping children.” Young people in Catholic schools and parish faith formation programs are taught about the great needs of the world’s poorest children and are then invited to pray and offer their sacrifices so that children in the missions can know that God loves them. 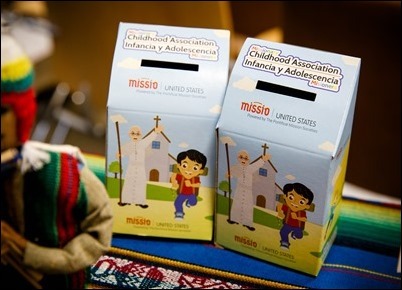 Those gifts support missionaries who are then able to share the corporal works of mercy along with the spiritual ones with mission children. 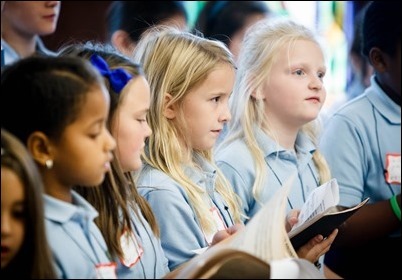 These little ones then have a chance to grow up and become the people of God’s intention. 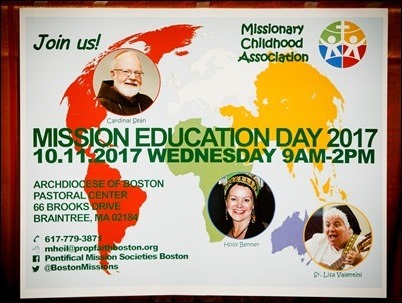 Each year we begin our MCA year by hosting a Mission Education Day. 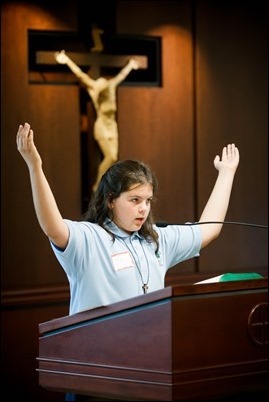 Held at the Pastoral Center in Braintree, we invite all Catholic schools and parish Faith Formation programs to send their student Mission Representatives accompanied by their adult Mission Moderators. The adults are on hand to guide, but in true Forbin de Janson style, the children lead the way. This is our theme for the year, set by Pope Francis himself. We take time during the day to learn about the basic tenants of MCA — prayer and sacrificial giving and actions. Our speakers and craft are always a highlight. 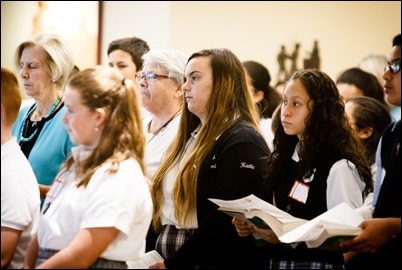 Our morning reflection came from Mrs. Holly Benner who is the MCA Coordinator for the Diocese of Allentown, Pennsylvania. 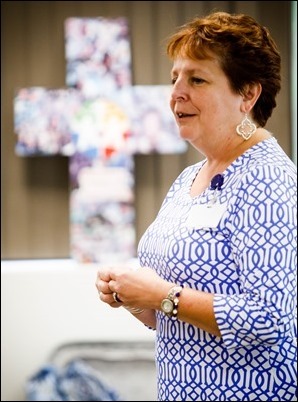 Before coming to this ministry, Holly ran a Catholic mission group called Needs for Africa which was responsible for bringing clean water to rural villages and seminaries in Uganda, Kenya, Tanzania, and Nigeria. Her stories of the improvement of the lives and health of the children in the villages were inspiring. 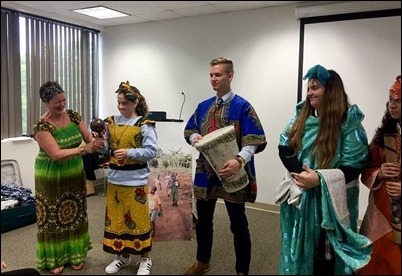 We had so much fun as Holly dressed attendees in the clothing of the countries that she has visited! Our morning Liturgy was celebrated by Cardinal Seán. 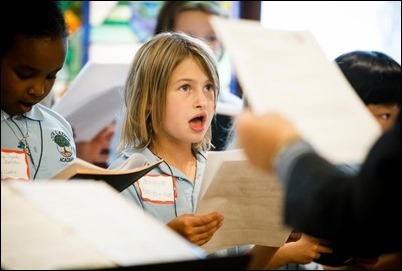 Our music was provided by the combined choir of Our Lady’s Academy and Our Lady Comforter of the Afflicted Parish of Waltham. 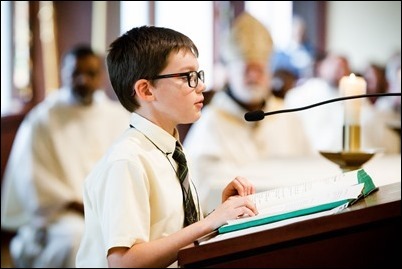 Our lector was a student from St. Jude’s in Waltham and the Servers were from Blessed Sacrament School in Walpole and St. Patrick School in Stoneham. 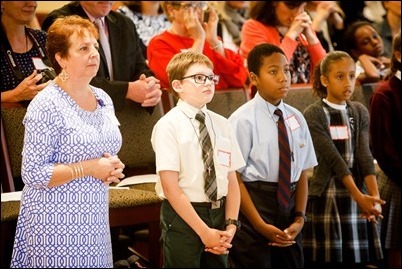 Intercessory Prayer readers were from St. Patrick Parish, Stoneham; St. Mary of the Hills School, Milton; Blessed Sacrament School, Walpole; St. John Paul II Catholic Academy, Dorchester; Quincy Catholic Academy; St. John the Baptist School, Peabody; and St. John the Evangelist School, Canton. Gift Bearers were from South Boston Catholic Academy. 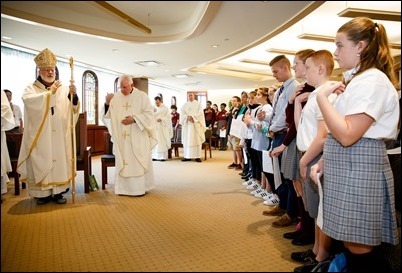 In all, 29 schools and parishes heard Cardinal Seán’s homily on the Gospel of the Great Commission, reminding us all that Jesus sends us to be his emissaries into the world by taking our own encounter with Christ and sharing it with everyone. 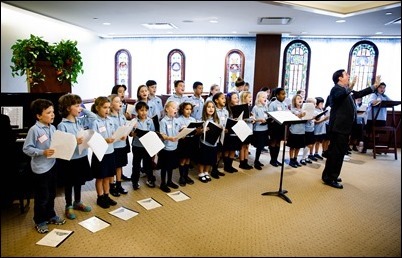 The students love visiting the Pastoral Center! 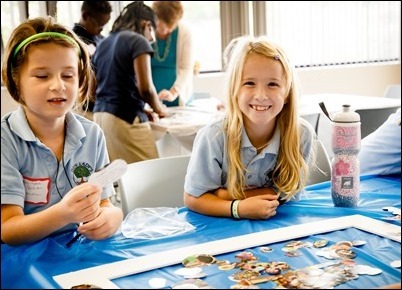 They also enjoy the time creating their own mission craft to take home to their school or parish. This year they created “selfie” frames to use when a student is “caught” being a missionary — they can snap a photo and post it to their own social media pages. 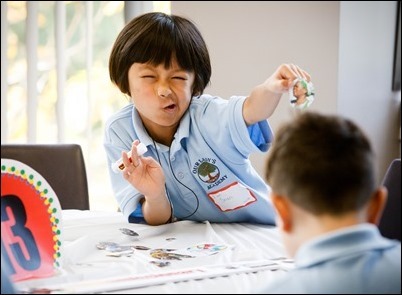 Our first volunteer shows great enthusiasm, don’t you think? 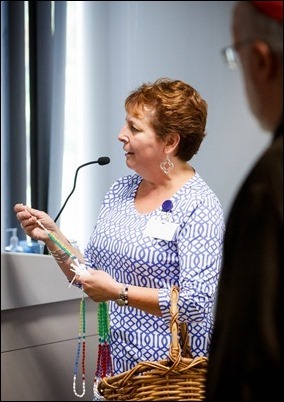 Our afternoon speaker was the dynamic Sister Lisa Valentini, MSC. Sister shared her own personal vocation story and asked the students to be listening: what is God calling you to do with your life? She also helped everyone to better understand the lives of children, especially orphans, in India, the site of her most recent mission experience. 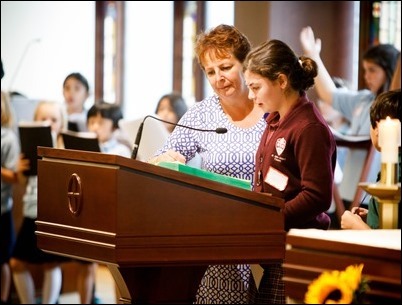 Cardinal Seán’s support is a great gift to us, as is the support of Mrs. Kathy Mears, Superintendent of Catholic Schools. Kathy encourages new principals to engage their students in the programs of the Missionary Childhood Association and is very helpful in promoting attendance at our Mission Education Day. 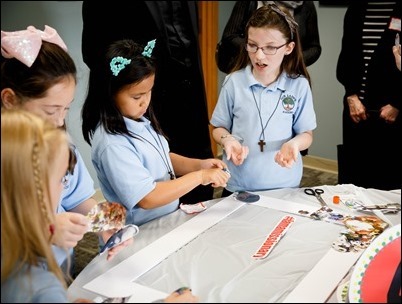 To learn more about how the program works in a practical way in classrooms watch this short video from Cardinal Seán, Kathy, and me! 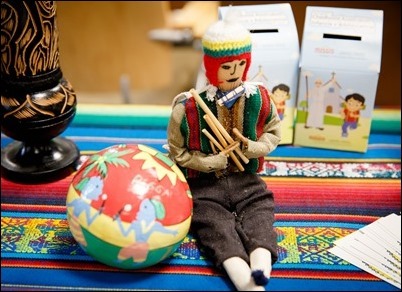 Another one of our yearly mission events is fast approaching: World Mission Sunday. On the next-to-last Sunday of every October, all Catholics — whether they worship in a tiny mission outstation or a grand cathedral — celebrate our universal call to mission through the work of the Society for the Propagation of the Faith. 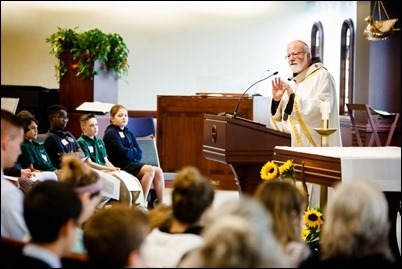 This year, World Mission Sunday is on Oct. 22; our main archdiocesan celebration will be at St. Columbkille Parish in Brighton at 11:15 a.m. Cardinal Seán will be our celebrant and homilist. This great day began in 1926 when Pope Pius XI decreed that it was right and necessary for the Church to reflect on what made us Catholic — the sharing of our faith to the ends of the earth. He also asked that a collection be taken up in all churches that day to support missionaries through his official mission agency — the Society for the Propagation of the Faith. The Propagation of the Faith was founded in 1822 when a young French woman named Pauline Marie Jaricot had a vision. She saw two oil lamps — one was empty, the other was full. She saw the full lamp refilling the empty one, without ever depleting itself. Pauline knew that the full lamp represented the missions of her day — including the United States. The empty lamp was France, still reeling from the secularization of the French Revolution. 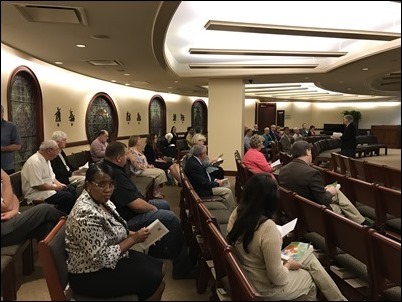 Pauline felt called to help renew the faith of her Church at home, “filling it up” with stories of faith from the growing Church of the missions. She went into the factories of Lyons, France and organized workers into small groups, “Prayer Circles,” asking them to pray daily and sacrifice weekly for work of the Church’s missionaries worldwide. Pauline’s genius was that the funds be used for the universal work of the missions, not just one particular place. 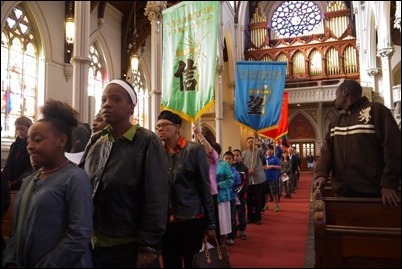 World Mission Sunday is a way to remind ourselves of our connection with our brothers and sisters around the world. I think of the work I’ve witnessed world-wide: in Africa, where millions of children receive an education in Church-run elementary schools and in Asia, where those who are sick are provided with loving care at thousands of Catholic hospitals and small clinics; in remote parts of South America, where trained catechists travel to countless remote areas to bring the Good News of the God’s great love to families. I’ve corresponded with many young men on small Pacific Islands who are supported in their studies for the priesthood, to bring the Lord’s healing hope and peace to those in need. This, and much more, is the work supported through the Society for the Propagation of the Faith. It has been a blessing to me to be associated with the Pontifical Mission Societies for almost 20 years. It seems that all of us who do this work stand on the shoulders of giants — especially those of our founders — “filling up” our home Church with stories we bring from the missions in order to enliven the faith of all. 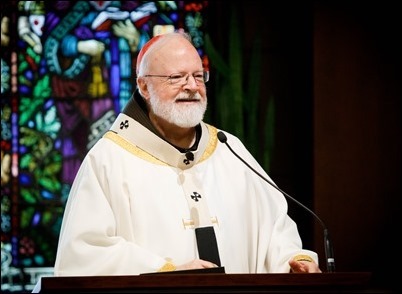 All of us at the Pontifical Mission Societies thank Cardinal Seán for the opportunity to share a part of our mission story with his blog readers. Now, no matter where you are … raise your hand if you are a missionary! Wednesday evening was one of our regular meetings of the Archdiocesan Pastoral Council, a group of very dedicated individuals who help advise me very much like a pastor receives advice from his parish council. 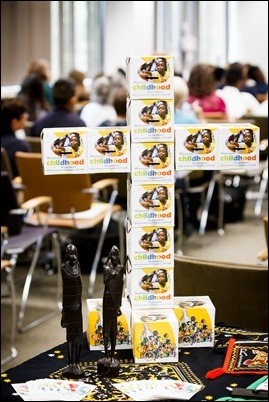 Typically, during our meetings we hear presentations on different archdiocesan initiatives and activities. At this gathering, we heard two presentations: one by Marianne Luthin and Sister Pat Boyle on the Catholic Leadership Conference that was held this summer in Orlando, and another by Marjean Perhot of Catholic Charities giving an overview of recent executive orders on immigration and refugees and the impact they have on Dreamers and those with Temporary Protected Status. 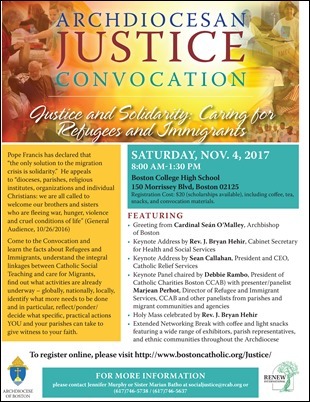 We also heard an update on the upcoming Archdiocesan Social Justice Convocation, which will be held Nov. 4 at Boston College High School. We are all very much looking forward to this very important annual event focusing on the social gospel of the Church, which will feature keynote addresses by Sean Callahan, the president of Catholic Relief Services and our own Father Bryan Hehir. 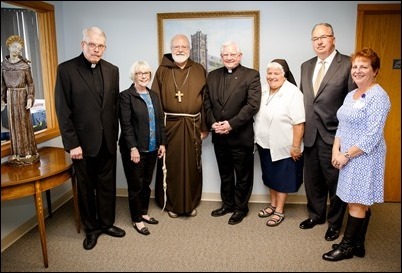 Thursday, we had our board meeting of the Massachusetts Catholic Conference. 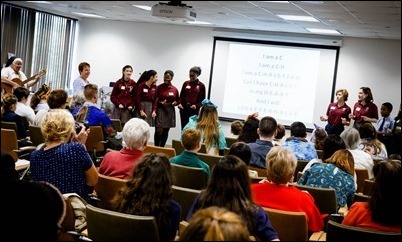 At this gathering we spoke about the new mental health initiative announced last week with Franciscan Children’s hospital and, of course, there is ongoing discussion about the possibility of physician assisted suicide being legalized in the Commonwealth. We are grateful to Jim Driscoll and his staff at the MCC for their fine work representing the interests of the Church in the public square. 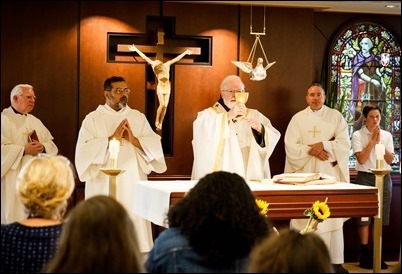 Finally, yesterday evening, I celebrated Mass with the parish community at the Cathedral, which we offered particularly for the hurricane victims in Puerto Rico. 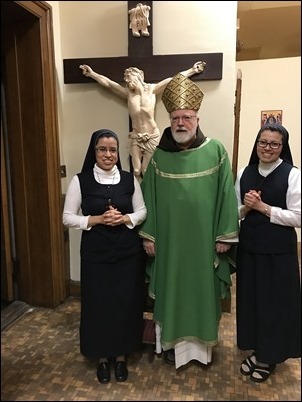 The Mass was also an opportunity to welcome Sister Petra, who will be working at the Cathedral and to thank Sister Velinda who will be returning home to Mexico, where she will live in the contemplative community of her order. 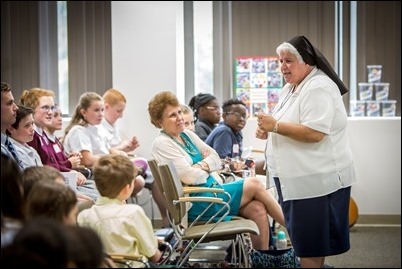 We are very grateful for the wonderful work that Sister Velinda has done the Cathedral over the last several years and are very grateful to her community, the Missionary Servants of the Word, for the help they have given to the archdiocese.